Adam getting ready for some heavy effing metal! Adam Marshall is as enthusiastic a metalhead as you could wish to meet. Clad in an Iron Maiden t-shirt and custom-made Maiden shoes he talks excitedly about pulling off the solo to Holy Wars… The Punishment Due, his thrash band Trichila, why too much commercial metal is down-tuned, knows more about NWOBHM and the ‘80s Florida death metal scene than a 14 year old really should, and baulks at his mum and Hammer singing Soul II Soul too loudly in a hotel lobby. Adam also has Osteosarcoma, a rare bone cancer. Shorn of his long blonde hair, he’s all smiles having finished his last round of chemotherapy a fortnight ago, and points out his metal credentials due to the metal plate put in his leg during treatment. But he’s not shy in detailing the dark times. As well as his belligerent determination, one thing that kept Adam going was the announcement of a UK tour by his favourite band, Iron Maiden. “The reason I’m here is because Iron Maiden announced that tour,” he says matter of factly. Sadly he was too ill to buy tickets for the band’s first UK run in six years, but a family support worker contacted Tom Pugh from nonprofit organisation Given To Live to see if he could help. A lifelong Pearl Jam fan, it was while listening to their immortal anthem Alive that he had an epiphany: to give people who were unable to attend gigs the gift of live music. In the three years since it began, Tom has taken dozens of disadvantaged youngsters to a line-up that covers Avenged Sevenfold and Slipknot to Olly Murs and Ed Sheeran. “It is about taking them to a gig, but I want this to be something Adam never forgets,” explains Tom, who offers a personal service that includes travel, plush hotels, meals out and bespoke posters to ensure the recipients receive just that. 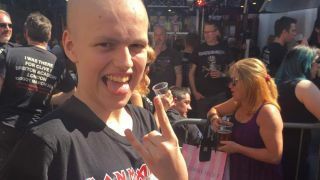 Tom was able to purchase tickets for both Maiden’s Cardiff and London dates, presenting them to Adam, who had his chemotherapy schedule altered so that he could be well enough to attend. The promise of seeing his first ever concert evidently pushed Adam on, and the messages of support that poured in from the Given To Live global community helped him through what he refers to as bad place. That Tom has managed to create such a global support network and treated so many from his small base of operations in Bristol is an achievement in itself. He has very few connections in the rock and metal community, which he praises for its well-known passion and support, and none outside it. Each experience comes from his relentless drive and tenacious desire to genuinely make a difference, giving those unable to enjoy the euphoric experience of live music that we other music fans may take for granted. Relying on donations and sponsors, Given To Live is now proving such a successful initiative that Tom currently has neither the funds or the man hours to accept all the nominations that come his way. He’s hoping a crowdfunding push will help him to hire an assistant in order to reach the goal of treating 20 gig-goers a year. When we catch up with Adam after the show his face says it all, grinning emphatically and describing the “best day of my life,” pointing out the Irons’ closing number Wasted Years and the line “Realising you’re living in the golden years,” being a poignant highlight. You can donate to Given To Live on their official website and contribute to their crowdfunding campaign.